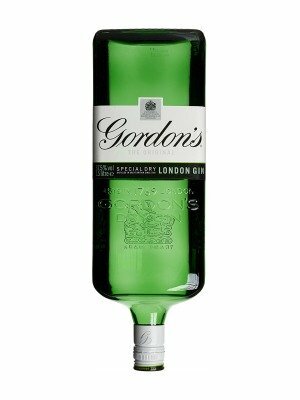 Gordon's Gin is a popular Gin available from DrinkSupermarket.com in 1.5lt to buy online. Visit DrinkSupermarket.com for the best price for 1.5lt of Gordon's Gin or compare prices on our other Gin products. Gordons Gin was founded by Alexander Gordon. In 1769 Alexander founded his world famous distillery in Southwark London. He wanted to create an unsweetened gloriously flavoured gin to fit on any table. While remaining true to Juniper the key ingredient to most gins, Gordon believed that success was in the perfect combination of pure distilled grain spirit and rich botanicals. Gordon's is triple distilled to guarantee the purity of the gin and the exact blend of our botanicals has remained closely guarded secret. Juniper berries are carefully selected from the pick of each year's crop. They are shaken rather than picked from the tree and then stored for up to two years to intensify the oils and mellow the flavours. As well as Juniper berries, the recipe includes coriander seeds, angelica root, liquorice, orris root, orange and lemon peel. You can buy Gordon's Gin online in most retailers and find it in the Gin aisle in supermarkets but we found the best deals online for Gordon's Gin in DrinkSupermarket.com, TheDrinkShop, and others. Compare the current price of Gordon's Gin in 1.5lt size in the table of offers below. Simply click on the button to order Gordon's Gin online now.